On July 17 my father will be teaching a classical riding clinic at Boavida Stables in Schomberg. This event is being hosted by Frank Psaila Jr., a long-time student of Grelo farms, who is opening his doors to guests for the first time. We encourage anyone interest in improving their riding to attend. And as usual, we'll have some terrific demonstrations to inspire you! 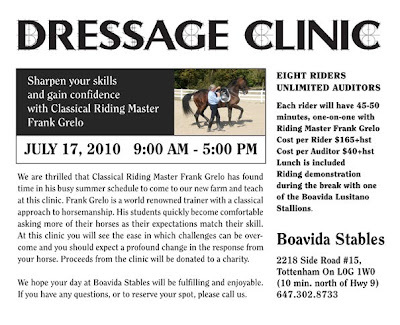 Call Boavida to book your spot, (647) 302-8733. Grelo Farms will be hosting a fundraising event for our Riding Club on Saturday, June 5th. It will feature an evening of performances by students of the farm as well as the Grelos. Tickets are already SOLD OUT!! If you would like to see this showcase of our talent, you are welcome to attend the dress rehearsal on Sunday, May 30th at 3:00pm. Not only will you be able to get a sneak peek of the show, you'll witness some of the behind the scenes action that makes this show possible. A courtesy $5.00 donation is welcome. Hope to see you there!